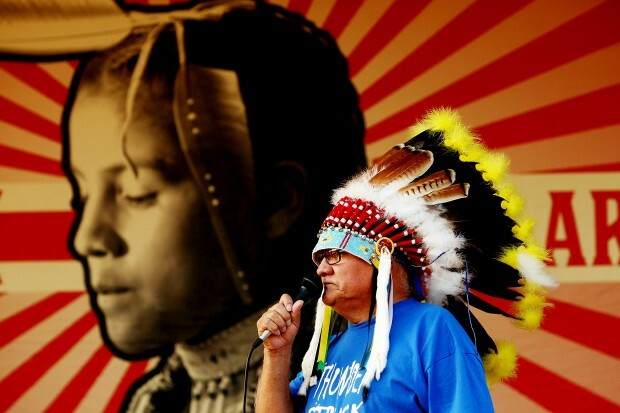 By Kristina BarkerOn Wednesday, nearly 250 activists—Native Americans of all ages, with a smattering of non-Natives—marched from the Memorial Park band shell to Omaha Street, stepping to the beat of a drum and holding aloft posters reading "The Black Hills Are Not For Sale." At Omaha Street, they lined up along the street for several minutes before heading back to the band shell. The poster was designed by Shepard Fairey, the same artist who created the iconic red and blue "Hope" poster for the 2008 campaign of then-presidential candidate Barack Obama. Several speakers at the rally called on supporters to bind together as one and spread the word of the land sale. By Derek OlsonEarlier this week an agreement was reached between area tribes and a family selling a tract of sacred land in the Black Hills known as Pe' Sla. On Wednesday night, people gathered at Rapid City's Memorial Park to give thanks for Pe' Sla, which was nearly sold at auction nearly two weeks ago. "People believe in the Bible, Adam and Eve, and how God created them. We believe in Pe' Sla," Cheyenne River Sioux Council Representative Robin LeBeau said. By Vincent SchillingAccording to Debra White Plume, a resident of Pine Ridge, information stating Pe’ Sla has been saved is not entirely correct. “Somehow the word is being put out there that we won and that Pe’ Sla has been saved. That message is wrong,” said White Plume. According to her, the initial process in that the Oglala Sioux Tribe asked a federal agency to intervene and the Black Hills were taken off public auction, was correct, however, after working with Last Real Indians (LRI) the tribes only made a down payment. In previous releases, stated amounts collected to help with the purchase of the sacred site included $1.3 million put up by the Rosebud Sioux Tribe and LastRealIndians.com, headed by attorney Chase Iron Eyes, which has raised more than $326,000. The funds were combined for the earnest offer made to the Reynolds family. The down payment, according to White Plume, has not yet sealed the deal. “The remainder of the purchase price still has to be paid to the Reynolds family, which is in about 21 days or so,” said White Plume. “So LRI is still raising funds to pitch in with the tribes. Until that final amount of money is paid in full, the land has not been returned to the Lakota people.Comment: This article also suggests an answer to the previous question: Why did the Reynolds family halt the auction? Because the Oglala Sioux Tribe called or threatened to call a federal agency. Presumably to inform it of a treaty or legal violation of Native rights. For more on the subject, see Tribes May Buy Pe' Sla and Pe' Sla Auction Canceled.